Considering how surprisingly popular the Nissan Juke has been since it was first introduced a few years ago, nobody’s going to hold it against Nissan if it continued to produce more powerful versions of the funky-looking crossover. To be fair, it’s hard to top the 500-horsepower Juke-R, but Nissan has continuously produced more and more powerful versions of the Juke, and at the 2013 Los Angeles Auto Show, another one is set to grace us with its presence. The new tuned-up crossover will pick up where the Juke Nismo left off. Taking that into account, the Juke Nismo RS offers an even more powerful engine, sport-tuned suspension with new springs and shock absorbers. There will also be a more aggressive exterior look, an updated interior and other cool Nismo features. Updated 11/20/2013: This review was updated with the official details, images and specs. Updated 02/28/2014: Nissan announced today prices for the 2014 Juke Nismo RS which will be put on sale at national dealers later this spring. 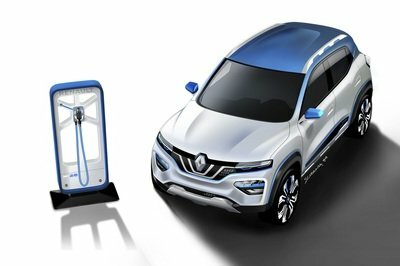 Prices for the sporty crossover will start from $26,120. 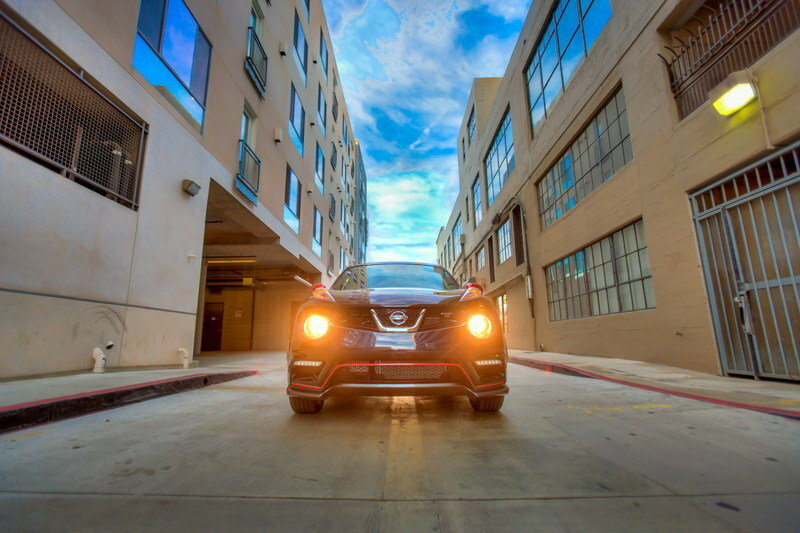 Click past the jump to read more about the 2015 Nissan Juke Nismo RS. The new Juke Nismo RS adds lots of updates to the exterior that makes it about 37% more aerodynamic than a standard Juke. These exterior updates include a new front fascia with a lower and more aggressive design, a new, larger grille and thin-strip LED accent lights replacing the usual fog lights. Updates continue on the side, where the wheel arches are more muscular, while the rear gets a deeper bumper, a unique liftgate and a new diffuser. As for the car’s paint scheme, it is traditional for the Nismo models. The car is painted black (here), combined with a "red stripe" going from the on the upper edge of the large lower grille and up to the front wheel arches. The same rd paint is used for the door mirrors and on a stripe visible on the black sill. The model will be further distinguished by "Nismo RS" badges placed on the grille and rear liftgate, both featuring the "O" painted red. Customers can choose between three exterior colors: Sapphire Black, Brilliant Silver and Pearl White. When compared to the Juke Nismo, most of the updates for the new Juke RS were made under the hood. In here Nissan installed Recaro front seats trimmed in red leather-appointed side bolsters and black suede center inserts. The rear seats also feature red stitching. 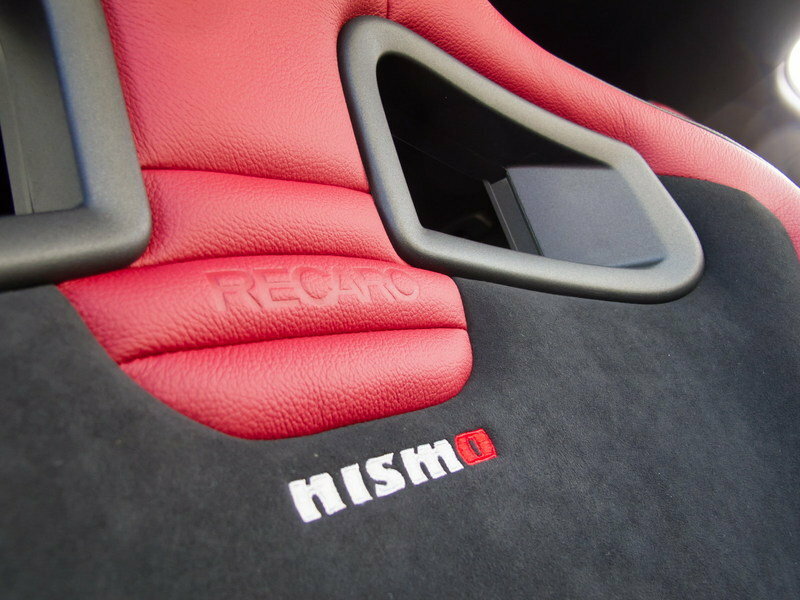 "Recaro" and "Nismo" logo are embossed on the front seats. Nissan used Alcantara for the steering wheel and a carbon fiber look for the trim around the center stack and shifter. A very cool "RS" logo was placed on the speedometer and on the charcoal grey suede meter hood. 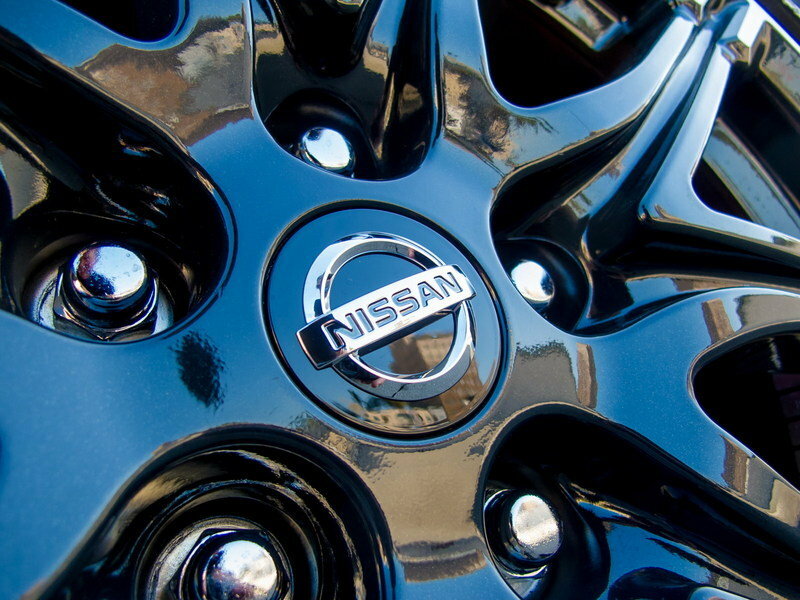 Under the hood Nissan placed a heavily revised 1.6 liter four-cylinder engine offered in two different level of power. In the models equipped with the front-wheel-drive system and the 6-speed gearbox it delivers 215 horsepower at 6,000 rpm and 210 pound-feet of torque between 3,600 and 4,800 rpm. In the models equipped with the all-wheel-drive system and the Xtronic CVT it delivers 211 horsepower at 6,000 rpm and 184 pound-feet of torque between 2,400 and 6,000 rpm. In order to deliver the extra power, the engine was upgraded with an optimized engine control (ECU) settings and a revised exhaust system with a larger main tube diameter and revised baffling. The new Juke Nismo RS will be offered with 18-inch lightweight aluminum-alloy wheels in a 10 twin-spoke design wrapped in 225/45R18 Continental ContiSportContact5 summer tires. In true Nismo tradition, the suspensions were tuned to deliver a more agile driving feeling and the car was brought slightly closer to the ground. The front-wheel-drive models are offered with an independent MacPherson strut front suspension and torsion beam rear suspension, while the all-wheel-drive models will offer a multi-link rear suspension design. There is also a new braking system that includes 4-wheel vented discs, larger brake rotors in front (12.6 inches versus 11.7 inches), vented rotors in the rear (versus non-vented in non-RS models), red-painted calipers and upgraded brake pads. All the updates offered for the new Juke Nismo RS allows it to move upmarket and stay face to face to more powerful models. 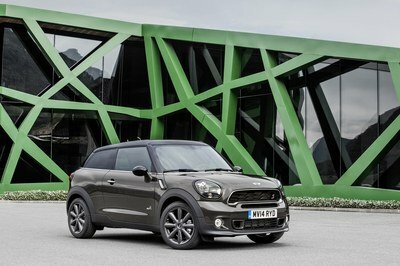 One of these models is the Mini Countryman JCW. 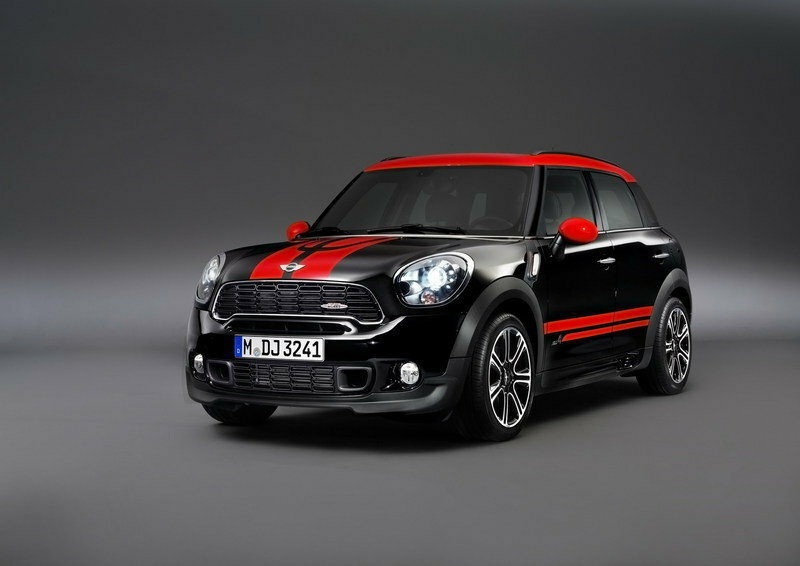 The JCW model is powered by a new, four-cylinder turbocharged engine that delivers a total of 218 horsepower at 6,100 rpm and a peak torque of 207 pound-feet between 2,000 and 5,600 rpm. It goes from 0 to 60 mph in 7.0 seconds and up to a top speed of 140 mph. The new Juke Nismo RS is a very nice attempt to transform a rather boring car into something that will attract lots of buyers. 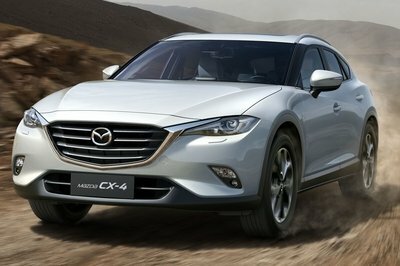 The model was updated with an aggressive exterior look, a powerful engine and with a highly updated interior. 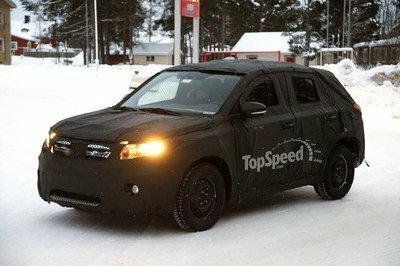 Even more it is offer with an AWD system that makes it suitable for any road, so if Nissan will keep it at a reasonable price we are sure it will enjoy a great success. To understand the difference between the Nissan JUKE sports crossover, the recently introduced JUKE NISMO and the new JUKE NISMO RS – which makes its North American debut today at the 2013 Los Angeles Auto Show – the one word is all that’s needed: More. "The concept behind the development of the new JUKE NISMO RS is giving the customers exactly what they have been asking for – more power, handling and exclusive equipment like Recaro seats and Alcantara®-wrapped steering wheel," said Pierre Loing, Vice President, Product and Advanced Planning and Strategy, Nissan North America, Inc. "And the best part is, it does it in a very balanced way, delivering up to 215 horsepower in combination with unique body and suspension upgrades." The idea of creating vehicles that can be driven everyday to work, but that you want to drive them the long, winding way home, is central to the NISMO design philosophy. As Nissan’s performance group, with its vision and name derived from NISsan MOtorsports, NISMO is applying its near-50 years of engineering experience and expertise to an expanding range of affordable production vehicles. Like the 370Z NISMO and JUKE NISMO before it, the new JUKE NISMO RS ups the excitement level for the driver while still remaining attainable for the average consumer. 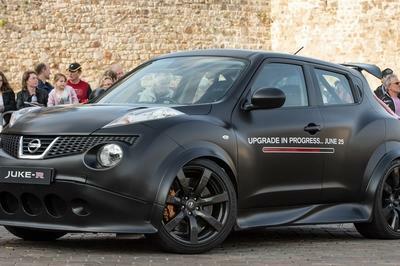 "JUKE buyers now have six distinct ways to experience ‘Innovation and excitement for all’ – the premium level of features and equipment offered by the JUKE S, SV and SL models, the sporty appearance and upgraded power of the JUKE NISMO, and the race car-inspired design and fun-to-drive performance of the new JUKE NISMO RS," added Loing. With the addition of the NISMO RS, JUKE buyers now have three distinct levels of drivetrain tuning to choose from to fit their driving style and needs. Every JUKE model starts with one of the most advanced engines in the Nissan portfolio – an inline 4-cylinder 1.6-liter DOHC aluminum-alloy Direct Injection Gasoline (DIG™) turbocharged engine. The engine’s direct injection helps improve combustion, enhancing power, torque, economy and emissions. The use of the turbocharger and intercooler also help boost power, while the variable timing control for both intake and exhaust cycles improves low-end engine response. For use in the JUKE S, SV and SL grades, the engine is rated at 188-horsepower and 177 lb-ft of torque. 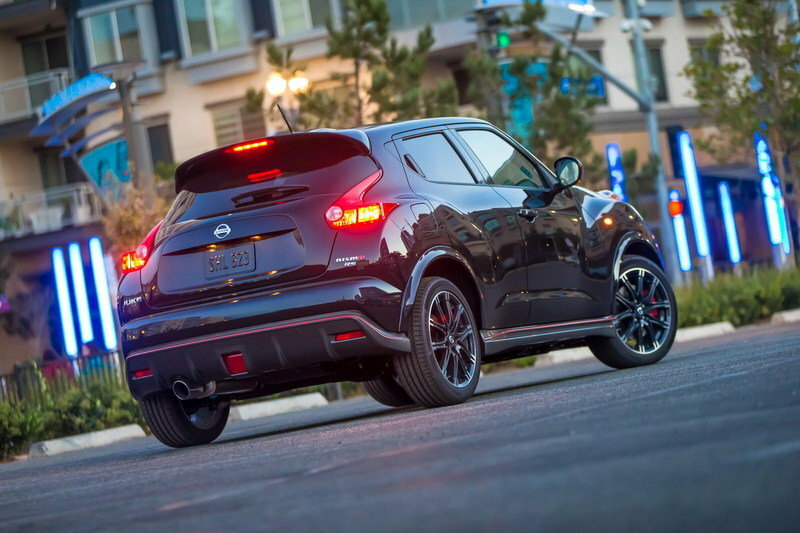 The JUKE NISMO increases the engine’s performance to 197 horsepower and 184 lb-ft of torque. 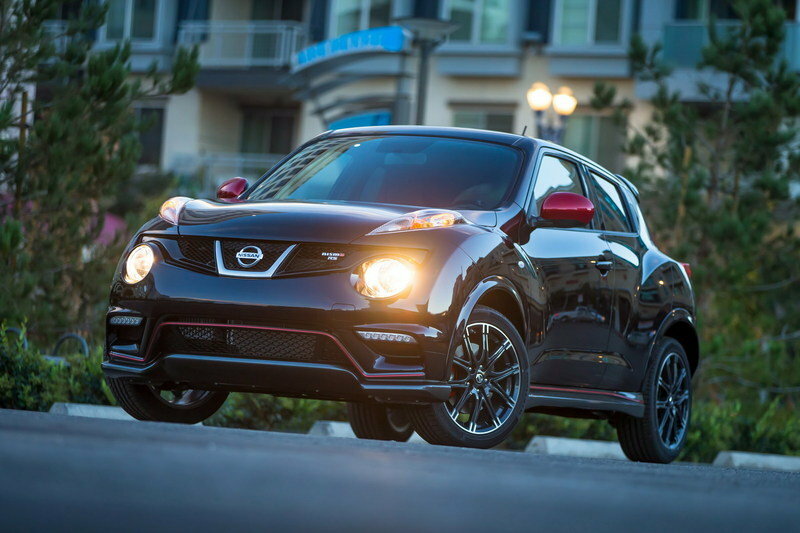 Also added to the JUKE NISMO are a NISMO-tuned suspension and 18-inch aluminum-alloy wheels. As "king" of the JUKE line, the new NISMO RS ups JUKE’s bragging rights to a best-in-class* 215 horsepower (at 6,000 rpm) and 210 lb-ft of torque (at 3,600 – 4,800 rpm) for the 6-speed manual transmission-equipped front-wheel drive model. 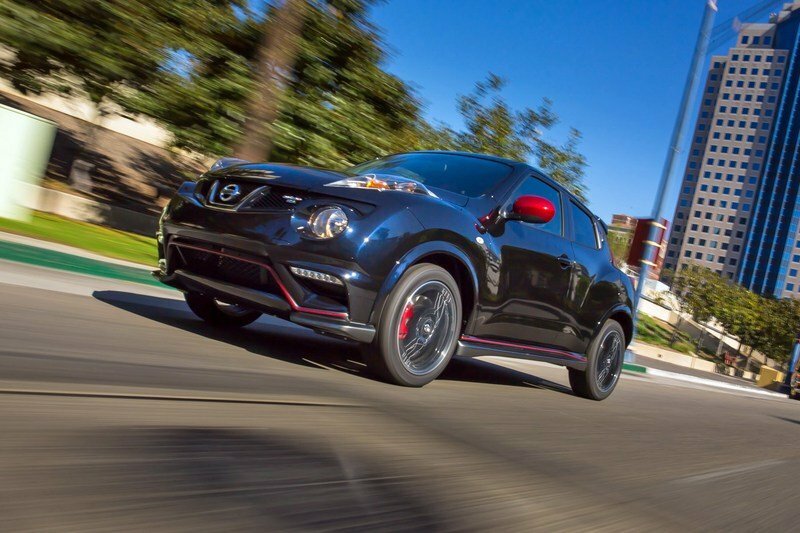 The JUKE NISMO RS All-Wheel Drive with Xtronic CVT® is rated at 211 horsepower (at 6,000 rpm) and 184 lb-ft of torque (at 2,400 – 6,000 rpm). Changes to the engine to create the higher power and torque figures include optimized engine control (ECU) settings and a revised exhaust system with a larger main tube diameter and revised baffling. "The JUKE NISMO RS’s exhaust has been tuned to create a highly visceral sound worthy of its racing-inspired roots," said Loing. The engine’s connecting rod durability has also been enhanced for use with higher torque settings with the manual transmission, along with a strengthened clutch cover and dual mass flywheel. 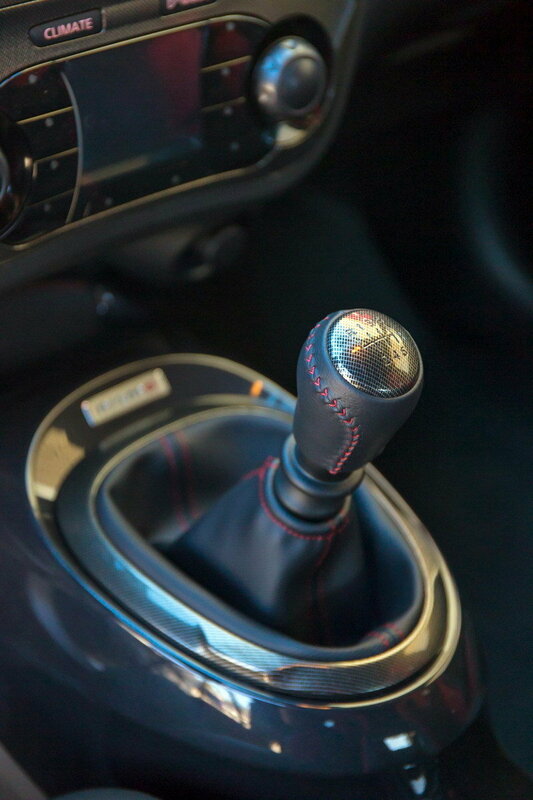 The new, high capacity 6-speed manual used in the JUKE NISMO RS is a different transmission than available in the other JUKE NISMO models and uses lower gear ratios in 1st through 3rd gears for quicker acceleration. Manual transmission-equipped models also offer a standard helical-geared Limited-Slip Differential (LSD). "We expect drivers to feel a noticeable increase in acceleration – especially the manual transmission model – in the RS versus the regular JUKE NISMO. It also holds peak torque longer. Combined with the Helical Limited-Slip Differential, which helps reduce torque steer, the sense of driving excitement is unmatched in the JUKE lineup," said Loing. All-Wheel Drive JUKE NISMO RS models also offer improved acceleration and a sportier driving feel. With its all-new steering column-mounted paddle shifters, NISMO RS AWD’s CVT utilizes technology found only in the Nissan Maxima sports sedan for an available manual feel. 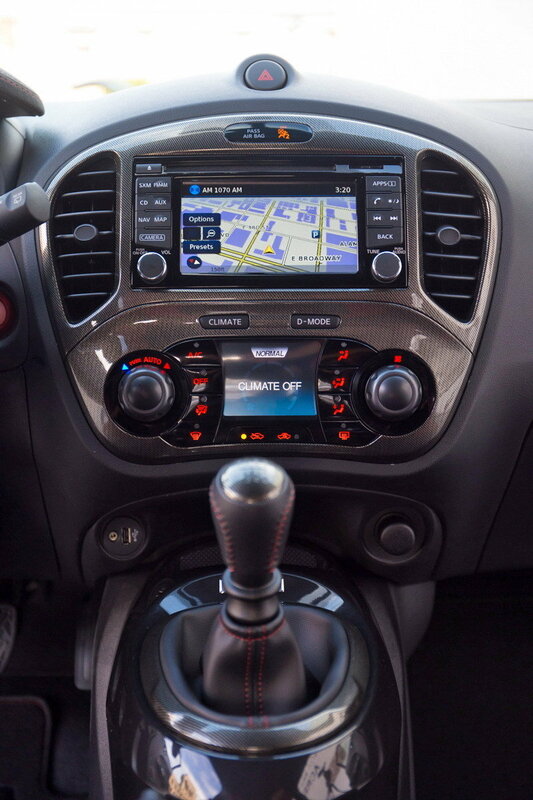 The CVT’s manual mode offers eight step "gearing" versus the JUKE NISMO CVT’s seven and base JUKE CVT’s six steps. In addition, the advanced torque vectoring AWD system has been specially tuned for the NISMO RS’s increased active cornering, providing better line control through corners. The system – standard in all 2014 JUKE AWD models – is designed to limit understeer by increasing torque to the outside rear wheel, helping the car follow its intended course, while enhancing agility, giving the JUKE NISMO exceptional ride comfort and handling in spite of its higher ground clearance when compared to compact cars. Torque can be split up to a maximum of 50:50 front to rear, as well as shifted from side-to-side across the rear axle, up to 50 percent per wheel. Information collected by various sources (measuring wheel speed, steering angle, yaw rate and lateral G-force) is interpreted to anticipate the driver’s intention. System actions are relayed to the driver via a real-time graphic display on the instrument panel depicting the torque distribution under all conditions. A significant bolster to JUKE NISMO RS’s engaging driving dynamics is a series of special body and chassis reinforcements designed to help increase overall rigidity. "The additional reinforcements and fixing points, used primarily for the higher torque front-wheel drive model, contribute to the increased steering precision and quicker response of the NISMO RS versus the JUKE NISMO," said Loing. In addition, the suspension and steering have been specially tuned to provide a more exciting and agile driving feel (versus non-RS models) without compromising ride comfort and noise, vibration and harshness (NVH). Spring rates and damping force have been reset and the front suspension link reinforced to enhance steering feel and response. Like the JUKE NISMO, the NISMO RS’s suspension has been lowered slightly versus non-NISMO JUKE models, reducing the gap between the tires and wheelwells for a cleaner appearance and improved aerodynamics. An independent MacPherson strut front suspension and torsion beam rear suspension are utilized on FWD models, while JUKE NISMO and NISMO RS AWD models offer a multi-link rear suspension design. A cradle-type front subframe enhances lateral stiffness of the assembly. Front and rear stabilizer bars are standard on all models. The Electric Power-assist Steering (EPS) has also been retuned for use in the NISMO RS. 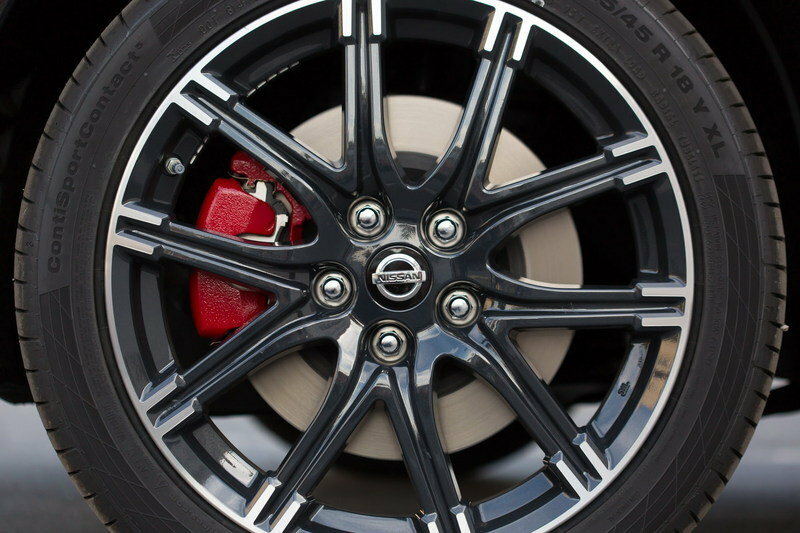 The JUKE NISMO RS braking system includes 4-wheel vented discs, larger brake rotors in front (12.6 inches versus 11.7 inches), vented rotors in the rear (versus non-vented in non-RS models), red-painted calipers and upgraded brake pads. "The JUKE NISMO RS has all of the actual hardware to go with the increased power, just as you’d expect from NISMO – which through its decades of motorsports experience understands that ‘fast’ alone is not enough, a car must be ‘balanced" to provide real performance," summed up Loing. The new JUKE NISMO RS shares much of its racing-inspired exterior modifications with the JUKE NISMO. 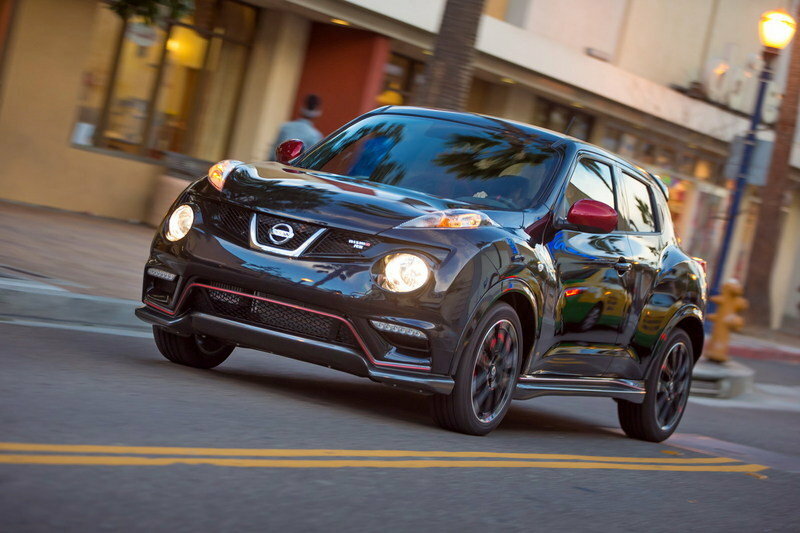 Compared to the standard JUKE, JUKE NISMO and NISMO RS show a 37-percent improvement in aerodynamic performance – thanks to items such as the front fascia and grille, which have been modified to better control airflow to the engine. The unique front end features a lower and more aggressive design. The regular fog lights have been replaced by thin-strip LED accent lights, positioned at the top edge of small vents to the side of the larger grille. A NISMO-themed "red stripe" accent line starts on the upper edge of the large lower grille and curves around the smaller vents and continues all the way to the front wheel arches. 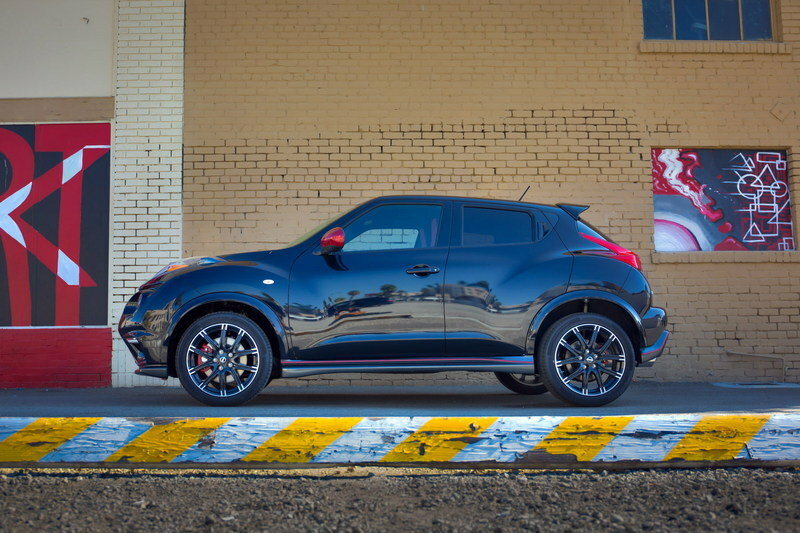 This distinctive NISMO cue gives the nose a visual width and presence while emphasizing the Juke NISMO’s athletic stance on the road. The signature Nissan V-strut grille is finished in a darker shade than standard JUKE models. 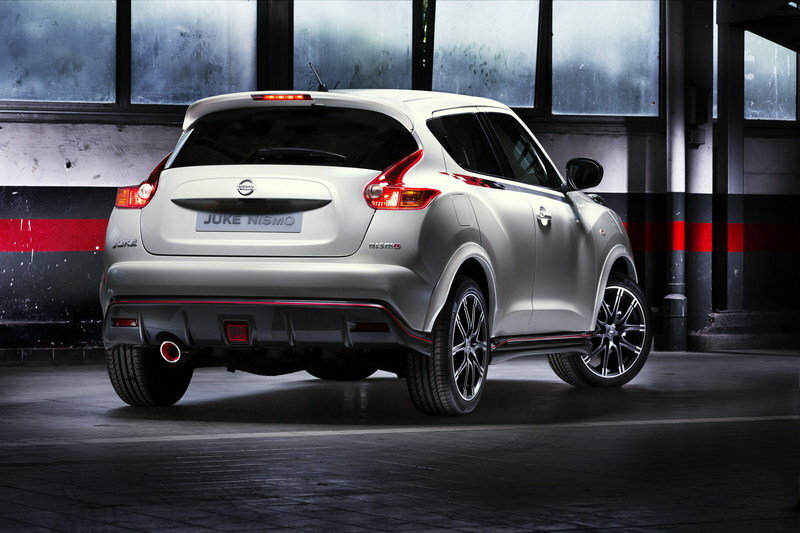 The distinctive JUKE combination lights are smoked as part of the NISMO appearance treatment. 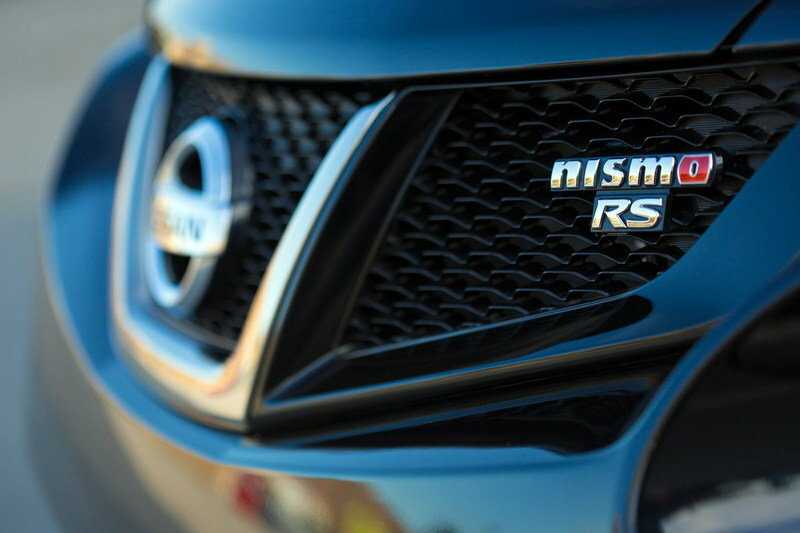 Subtle NISMO RS badges with a red "O" are located on the front grille and to the right of the rear liftgate. The red pinstripe continues on the flanks of the car at the base of the doors. The sculpted side skirts enhance aerodynamic performance, directing airflow around the rear wheels and away from the car as quickly and efficiently as possible. To increase the JUKE NISMO and NISMO RS’s visual stance, the wheel arches are more muscular and are body colored. The door mirrors are painted red to give a visual indication that these are not standard Nissan JUKEs. The B-pillars are finished in gloss "piano black," also promoting a sleek and sporty image. In the rear, the bumper is deeper than on non-NISMO models and the red pinstripe is also visible on the black sill. The unique body-colored liftgate spoiler and rear fascia diffuser complete the body modifications. Also part of the dramatic exterior appearance are the unique 18-inch lightweight aluminum-alloy wheels with 225/45R18 Continental ContiSportContact5 summer tires, which help give drivers additional grip during cornering and further boost the JUKE NISMO and NISMO RS’s on-road presence. The diamond-cut alloys feature a 10 twin-spoke design and are finished in dark anthracite. The 2014 Nissan JUKE NISMO RS is available in three exterior colors – Sapphire Black, Brilliant Silver and Pearl White. Inside, JUKE NISMO RS’s biggest departure from the JUKE NISMO is the addition of genuine Recaro front seats trimmed in red leather-appointed side bolsters and black suede center inserts. The seats, based on the popular Recaro "Sportster" design, are designed to hold the driver and front passenger firmly in place during spirited driving. They feature embossed Recaro and NISMO logos, along with red stitching. The JUKE NISMO RS also offers an Alcantara®–trimmed steering wheel and exclusive "RS" logo on the speedometer and charcoal grey suede (with red stitching) meter hood. The surface trim around the center stack and shifter features a special carbon fiber look. Similar to the JUKE NISMO, the rear seats also feature red stitching. Like the JUKE NISMO, other standard content includes privacy glass, Nissan Intelligent Key® with Push Button Start and the I-CON (Integrated Control) system with automatic air conditioning. Just one option package is available with the JUKE NISMO RS, the Navigation Package with NissanConnect™ with Navigation system with 5.8-inch touch-screen, 3D-effect map views, Voice Recognition and NavTraffic capability (SiriusXM subscription required, sold separately); NissanConnect™ Apps; Rockford Fosgate ecoPUNCH™ audio system; USB interface (iPod® compatible); and RearView Monitor.